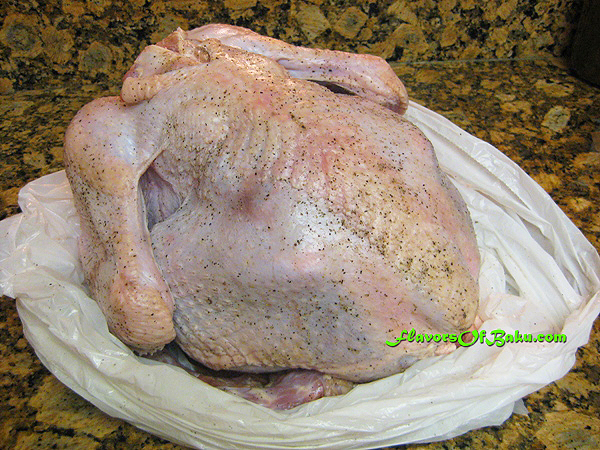 Before cooking the turkey, make sure that it is completely thawed. Do not forget to remove any packaging and the bag of giblets (hidden in a body cavity and in the neck cavity). Marinating the turkey before cooking it will result in moist, tender, and perfectly seasoned turkey meat. Slice the onions into half rings, put them in a bowl, and add 2 teaspoons of salt. Massage the salt into the onions and squeeze them with your hand until the onions get soft and a little juice will come out. Then add 1 cup of chicken stock to the onions and mix together. Place the turkey in a plastic bag. Sprinkle the outside of the turkey generously with salt and pepper. Rub salt and pepper inside the cavity as well and coat the turkey with the onion mixture. Seal the bag well to prevent any leakage and marinade it in the refrigerator overnight or longer. Peel and chop the onion and fry in the butter until golden brown. Crumble the nuts in the blender or in the food processor. 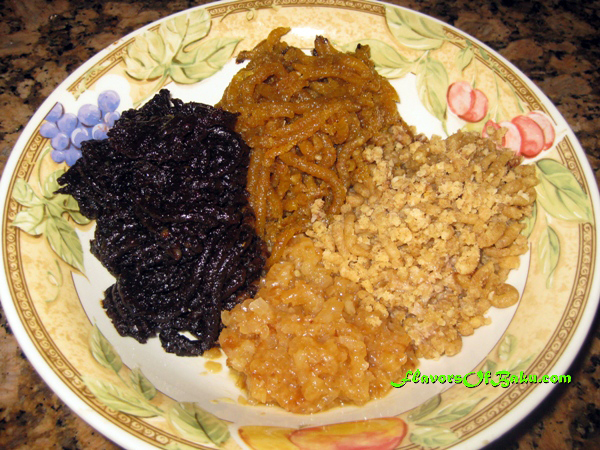 Grind in the food processor or in the meat grinder washed and dried raisins, prunes and cherry-plums. 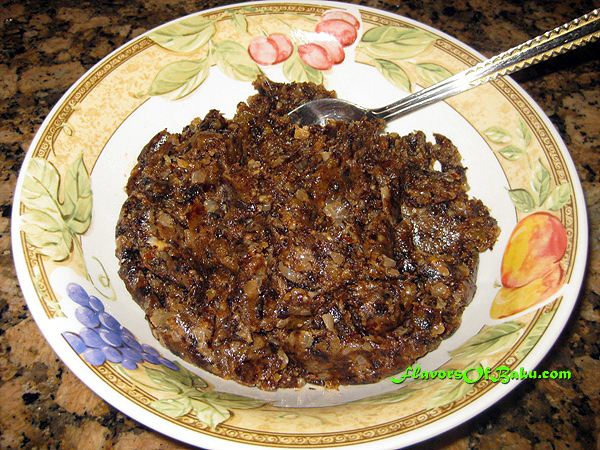 If you are using lavashana plunged it into hot water to make it softer. Cherry-plum pastille can be used instead of lavash. Mix well all stuffing’s ingredients together, add more melted butter if necessary. 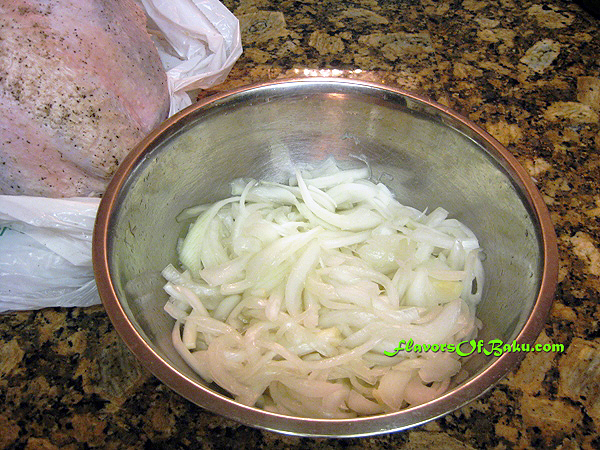 Remove the turkey from the refrigerator 1 hour before roasting and remove all the onions from it. Place the turkey in a roasting pan or roasting rack breast-side up. Pour melted butter over the turkey and rub it all over to coat it well. Leave your turkey unstuffed for now. You will stuff the turkey one hour before it is done roasting. If you do it this way, the turkey will be cooked more evenly. Preheat the oven to 350°F (180°C). Put the turkey into the oven, add 1 cup of broth or water and roast it until it is cooked. 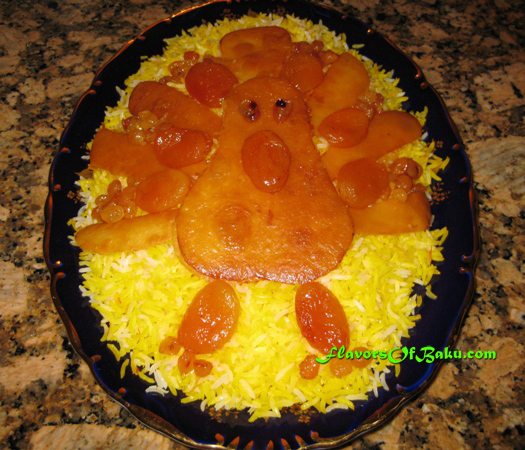 Usually, a turkey is cooked 20 minutes per pound. Every 20-30 minutes, remove the turkey from the oven and baste it all over. 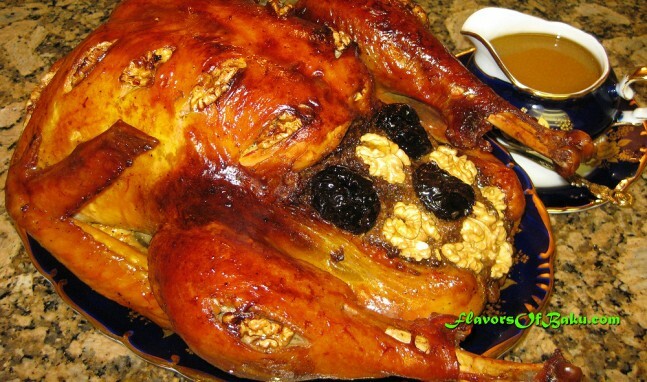 You can do it with a turkey baster or a spoon to scoop up the turkey’s juices and pour it on top. One hour before the turkey is done cooking, remove it from the oven, and using a spoon (because the turkey is going to be hot) carefully put your stuffing into the turkey cavity, packing it firmly inside (instead of levengi stuffing, you can use any stuffing of your choice.) If you are roasting a large turkey, just double the stuffing’s ingredients. To make sure that turkey is fully cooked through, check its temperature in the breast and the thigh. The temperature should be at least 165°F. If your turkey is golden brown, but not cooked yet, just loosely cover it with the foil. 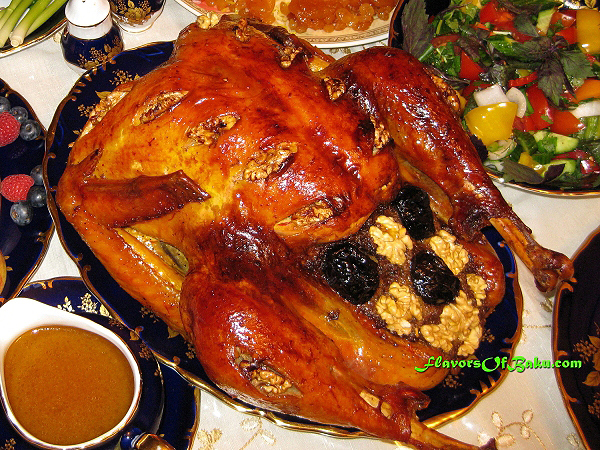 Remove the turkey from the oven, cover it with aluminum foil, and leave it to rest for 20 minutes before serving. The meat will firm up and the juices will be re-absorbed into the muscle tissue, making the turkey easier to slice and making it taste juicier.